Parris, K. M. (2016). Ecology of Urban Environments (Wiley Blackwell, Oxford). Parris, K. M. (2015). Ecological impacts of road noise and options for mitigation. Pp. 151-158 in R. van der Ree, C. Grilo and D. Smith (eds), Handbook of Road Ecology (Wiley, New York). Potvin, D. A., Mulder, R. A. and Parris, K. M. (2013). Acoustic and genetic adaptations in the silvereye (Zosterops lateralis). Pp. 171-180 in D. Gill & H. Brumm (eds) Avian Urban Ecology (Oxford University Press, Oxford). Parris, K. M. (2009). Towards a comparative ecology of cities and towns. Pp. 567-573 in M. J. McDonnell, A. K. Hahs and J. Brueste (eds) Ecology of Cities and Towns: A Comparative Approach (Cambridge University Press, Cambridge). Sievers, M. K., Hale, R., Swearer, S. E., and Parris, K. M. (2018). Contaminant mixtures interact to impair predator-avoidance behaviours and survival in a larval amphibian. Ecotoxicology and Environmental Safety 161, 482-488. Sievers, M. K., Hale, R., Parris, K. M., and Swearer, S. E. (2018). Impacts of human-induced environmental change in wetlands on aquatic animals. Biological Reviews 93, 529-554. Melville, J., Haines, M. L., Boysen, K., Hodkinson, L., Kilian, A., Smith-Date, K. L., Potvin, D. A., Parris, K. M. (2017). Identifying hybridization and admixture using SNPs: application of the DArTseq platform in phylogeographic research on vertebrates. Royal Society Open Science 4, 161061. Potvin, D. A., Parris, K. M., Date, K. L. S., Keely, C. C., Bray, R. D., Hale, J., Hunjan, S., Austin, J. J., and Melville, J. (2017). Genetic erosion and escalating extinction risk in frogs with increasing wildfire frequency. Journal of Applied Ecology 54, 945-954. Parris, K. M. (2016). Do we need a new theory of urban ecology? Bulletin of the British Ecological Society 47, 28-31. Canessa, S., Converse, S., West, M., Clemann, N., Gillespie, G., McFadden, M., Silla, A. J., Parris, K. M. and McCarthy, M. A. (2016). Planning for ex‐situ conservation in the face of uncertainty. Conservation Biology 30: 599-609. Keely, C. C., Hale, J. M., Heard, G. W., Parris, K. M., Sumner, J., Hamer, A. J., Melville, J. 2015. Genetic structure and diversity of the endangered growling grass frog in a rapidly urbanizing region. Royal Society Open Science 2: 140255. Potvin, D. A., Mulder, R. A., and Parris, K. M. (2014). Silvereyes decrease acoustic frequency but increase efficacy of alarm calls in urban noise. Animal Behaviour 98: 27-33. Jellinek, S., Parris, K. M., McCarthy, M. A., Wintle, B. A. and Driscoll, D. A. (2014). Reptiles in restored agricultural landscapes: the value of linear strips, patches and habitat condition. Animal Conservation 17: 544-554. Keith, D. A., Mahony, M., Hines, H., Elith, J., Regan, T. J., Baumgartner, J. B., Hunter, D., Heard, G. W., Mitchell, N. J., Penman, T., Parris, K. M., Tracey, C., Scheele, B., Simpson, C. C., Tingley, R., West, M. and Akçakaya, H. R. (2014). Detecting extinction risk from climate change with IUCN Red List criteria. Conservation Biology 28 (3): 810-819. Jellinek, S., Rumpff, L., Driscoll, D. A., Parris, K. M. and Wintle, B. A. (2014). Modelling the benefits of habitat restoration in socio-ecological systems. Biological Conservation 169: 60-67. Parris, K. M. and McCarthy, M. A. (2013). Predicting the effect of urban noise on the active space of avian vocal signals. The American Naturalist 182: 452-464. Ritchie, E. G., Nimmo, D. G., Bradshaw, C. J. A., Burgman, M. A., Martin, J. K., McCarthy, M. A., Parris, K. M., Dickman, C. A., French, K., Hobbs, R., Hughes, L., Johnson, C. N., Johnston, E., Laurance, W. F., Lindenmayer, D. B., Lunt, I. D., McIntyre, S., Possingham, H. P., Pressey, R., Watson, D. M. and Woinarski, J. (2013). Relaxed laws imperil Australian wildlife. Nature 498: 434. Smith, K. L., Hale, J. M., Gay, L., Kearney, M., Austin, J. J., Parris, K. M. and Melville, J. (2013). Spatio-temporal changes in the structure of an Australian frog hybrid zone: a 40 year perspective. Evolution 67: 3442–3454. Canessa, S. and Parris, K. M. (2013). Multi-scale, direct and indirect effects of the urban stream syndrome on amphibian communities in streams. PLOS One 8(7): e70262. Hale, J. M., Heard, G. W., Smith, K. L., Parris, K. M., Austin, J. J., Kearney, M. and Melville, J. (2013). Structure and fragmentation of growling grass frog metapopulations. Conservation Genetics 14: 313-322. Hamer, A. J. and Parris, K. M. (2013). Predation modifies larval amphibian communities in urban ponds. Wetlands 33: 641-652. Heard, G. W., McCarthy, M. A., Scroggie, M. P., Baumgartner, J. B. and Parris, K. M. (2013). A Bayesian model of metapopulation viability, with application to an endangered amphibian. Diversity and Distributions 19: 555-566. Jellinek, S., Parris, K. M. and Driscoll, D. A. (2013). Are only the strong surviving? Little influence of restoration on beetles (Coleoptera) in an agricultural landscape. Biological Conservation 162: 17-23. Jellinek, S., Parris, K. M., Driscoll, D. A. and Dwyer, P. D. (2013) Are incentive programs working? Landowner attitudes to ecological restoration of agricultural landscapes. Journal of Environmental Management 127: 69-76. McCarthy, M. A., Moore, J. L., Morris, W. K., Parris, K. M., Garrard, G.E., Vesk, P.A., Rumpff, L., Giljohann, K.M., Camac, J.S., Bau, S.S., Friend, T., Harrison, B., and Yue, B. (2013). The influence of abundance on detectability. Oikos 122: 717-726. Potvin, D. A., Parris, K. M. and Mulder, R. A. (2013). Limited genetic differentiation between acoustically divergent populations of urban and rural silvereyes (Zosterops lateralis). Evolutionary Ecology 27: 381-391. Wilson, J. N., Bekessy, S., Parris, K. M., Gordon, A., Heard, G. W. and Wintle, B. A. (2013). Impacts of climate change and urban development on the spotted marsh frog (Limnodynastes tasmaniensis). Austral Ecology 38: 11-22. Potvin, D. A. and Parris, K. M. (2012). Song convergence in multiple urban populations of silvereyes (Zosterops lateralis). Ecology and Evolution 2: 1977-1984. Wintle, B. A., Walshe, T. V., Parris, K. M. and McCarthy, M. A. (2012). Designing occupancy surveys and interpreting non-detection when observations are imperfect. Diversity and Distributions 18: 417-424. Canessa, S., Heard, G. W., Parris, K. M. and McCarthy, M. A. (2012). Integrating variability in detection probabilities when designing wildlife surveys: a case study of amphibians from south-eastern Australia. Biodiversity and Conservation 21: 729-744. McCarthy, M. A., Garrard, G. E., Moore, A. L., Parris, K. M., Regan, T. J. and Ryan, G. E. (2011). The SAFE index should not be used for prioritization. Frontiers in Ecology and the Environment 9: 486-487. Hamer, A. J. and Parris, K. M. (2011). Local and landscape determinants of amphibian communities in urban ponds. Ecological Applications 21: 378-390. Potvin, D. A., Parris, K. M. and Mulder, R. A. (2011). Geographically pervasive effects of urban noise on frequency and syllable rate of songs and calls in silvereyes (Zosterops lateralis). Proceedings of the Royal Society B 278: 2464-2469. Parris, K. M., McCall, S. C., McCarthy, M. A., Minteer, B. A., Steele, K., Bekessy, S. and Medvecky, F. (2010). Assessing ethical trade-offs in ecological field studies. Journal of Applied Ecology 47: 227-234. McCarthy, M. A., Weller, W. F. and Parris, K. M. (2009). Effects of toe clipping on survival, recapture and return rates of Jefferson Salamanders (Ambystoma jeffersonianum) in Ontario, Canada. Journal of Herpetology 43: 394-401. McCarthy, M. A. and Parris, K. M. (2008). Optimal marking of threatened species to balance benefits of information with impacts of marking. Conservation Biology 22: 1506-1512. Parris, K. M. and McCarthy, M. A. (2008). Toe clipping of anurans for mark-recapture studies: acceptable if justified. Herpetological Review 39: 148-149. Parris, K. M. (2006). Urban amphibian assemblages as metacommunities. Journal of Animal Ecology 75: 757-764. Parris, K. M. and Hazell, D. L. (2005). Biotic effects of climate change in urban environments: the case of the grey-headed flying-fox (Pteropus poliocephalus) in Melbourne, Australia. Biological Conservation 124: 267-276. McCarthy, M. A. and Parris, K. M. (2004). Clarifying the effect of toe clipping on frogs with Bayesian statistics. Journal of Applied Ecology 41: 780-786. Parris, K. M. (2004). Environmental and spatial variables influence the composition of frog assemblages in sub-tropical eastern Australia. Ecography 27: 392-400. Parris, K. M. and Lindenmayer, D. B. (2004). Evidence that creation of a Pinus radiata plantation in south-eastern Australia has reduced habitat for frogs. Acta Oecologica 25: 93-101. Wintle, B. A., McCarthy, M. A., Parris, K. M. and Burgman, M. A. (2004). Precision and bias of methods for estimating point survey detection probabilities. Ecological Applications 14: 703-712. McCarthy, M. A., Parris, K. M., van der Ree, R., McDonnell, M. J., Burgman, M.A., Williams, N. S. G., McLean, N., Harper, M. J., Meyer, R., Hahs, A. and Coates, T. (2004). The habitat hectares approach to vegetation assessment: an evaluation and suggestions for improvement. Ecological Management and Restoration 5: 24-27. Tyre, A. J., Tenhumberg, B., Field, S. A., Niejalke, D., Parris, K. and Possingham, H. P. (2003). Estimating false negative error rates for presence/absence data: Improving precision and reducing bias in biological surveys. Ecological Applications 13: 1790-1801. Parris, K. M. (2002). More bang for your buck: The effect of caller position, habitat and chorus noise on the efficiency of calling in the spring peeper. Ecological Modelling 156: 213-224. Parris, K. M. (2002). The distribution and habitat requirements of the great barred frog Mixophyes fasciolatus. Wildlife Research 29: 469-474. Parris, K. M. and McCarthy, M. A. (2001). Identifying effects of toe clipping on anuran return rates: the importance of statistical power. Amphibia-Reptilia 22: 275-289. Parris, K. M. (2001). Distribution, habitat requirements and conservation of the cascade treefrog (Litoria pearsoniana, Anura: Hylidae). Biological Conservation 99: 285-292. Williams, N. S. G., Leary, E. J., Parris, K. M. and McDonnell, M. J. (2001). The potential impact of freeways on native grassland. Victorian Naturalist 188: 4-15. Lindenmayer, D. B., McCarthy, M. A., Parris, K. M. and Pope, M. L. (2000). Habitat fragmentation, landscape context, and mammalian assemblages in southeastern Australia. Journal of Mammalogy 81: 787-797. Parris, K. M. and McCarthy, M. A. (1999). What influences the structure of frog assemblages at forest streams? Australian Journal of Ecology 24: 495-502. Parris, K. M., Norton, T. W. and Cunningham, R. B. (1999). 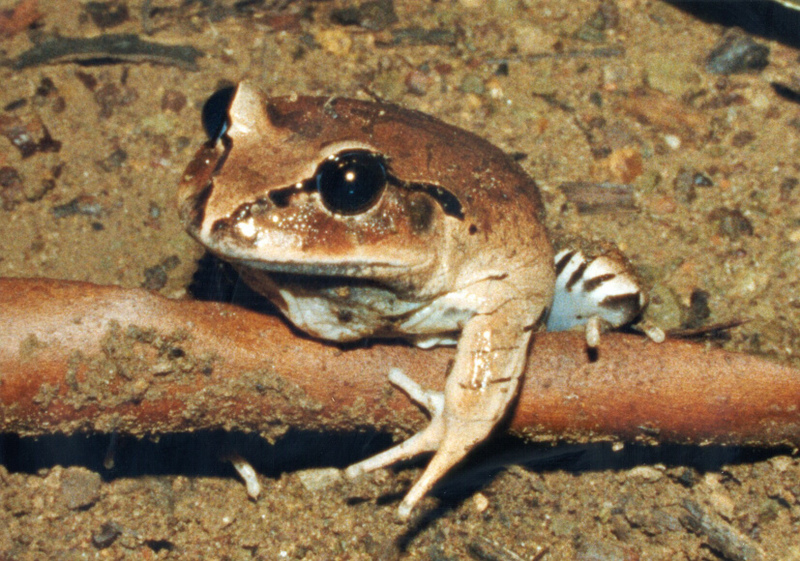 A comparison of techniques for sampling amphibians in the forests of south-east Queensland, Australia. Herpetologica 55: 271-283. McGuigan, K., McDonald, K., Parris, K., and Moritz, C. (1998). Mitochondrial DNA diversity and historical biogeography of a wet forest-restricted frog (Litoria pearsoniana) from mid-east Australia. Molecular Ecology 7: 175-186. Parris, K. M., Drinnan, A. N. and Cantrill, D. J. (1995). Palissya cones from the Mesozoic of Australia and New Zealand. Alcheringa 19: 87-111. Parris, K. M. (2002). Assessment of amphibian diversity in the Blackall and Conondale Ranges, south-east Queensland. Pp. 65-75 in A. E. O. Natrass (ed.) Frogs in the Community (Queensland Frog Society Inc., East Brisbane). Parris, K. M. and Norton, T. W. (1997). The significance of State Forests for conservation of Litoria pearsoniana (Copland) and associated amphibians. Pp. 521-526 in P. Hale and D. Lamb (eds) Conservation Outside Nature Reserves (Centre for Conservation Biology, University of Queensland). Parris, K. M. (2016). Three ways frogs and roads don’t mix. Pursuit, January 2016. Parris K. M. (2009). What are strategic impact assessments? Decision Point 32: 4-6. Parris, K. M. (2006). City slickers. Wildlife Australia Winter 2006: 20-23. En Chee, Y., Parris, K. M., West, M. et al. (2016). Comment on Review of the Native Vegetation Clearing Regulations – Consultation Paper. Submission to the Victorian Department of Environment, Land, Water, and Planning. Parris, K. M. et al. (2015). Comment on Unleashing the Potential of Nature: Discussion Paper on City Ecology, Ecosystems and Biodiversity. Submission to the City of Melbourne. Parris, K. M. and McCarthy, M. A. (2014). The adequacy of arrangements to prevent the entry and establishment of invasive species likely to harm Australia’s environment. Submission to the Senate Enquiry into Environmental Biosecurity. Parris, K. M. et al. (2009). Requirements under the EPBC Act and Victorian legislation. Submission to the Growth Areas Authority (Victorian Government) on the Strategic Impact Assessment report for the proposed expansion of Melbourne’s urban growth boundary. Parris K. M. et al. (2009). Strategic assessments and bioregional planning, with special reference to the Strategic Impact Assessment for the proposed expansion of Melbourne’s urban growth boundary. Submission on the Interim Report for the Independent Review of the EPBC Act 1999.